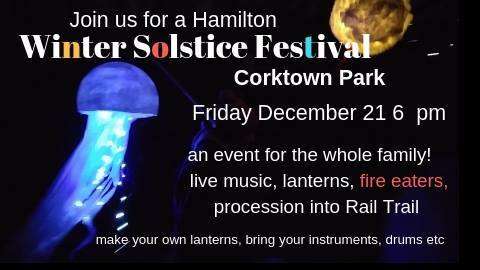 Home / Come Celebrate at the Winter Solstice Festival in Hamilton! I will be in full snow queen costume (and maybe stilts if it doesn’t snow too much!) with my friends from the Hamilton Aerial Group! It’s going to be a wondrous and magical event, so be sure to mark your calendar and come celebrate with us! Many people around the world celebrate festivals of lights during this time of year. The days get shorter until shortest day and longest night on winter solstice. Every day after the solstice will get a little longer and cultures from time immemorial have been celebrating the return of the sun and light. Many cultures, at this dark time of the year use lights to brighten up the long nights. 8 :30 pm. We hope to have the trail lit with decorations and artwork. We will have many local artists join us with live music, stilts, fire artists, projections, light design etc. Bring your lanterns and instruments. Join us! !